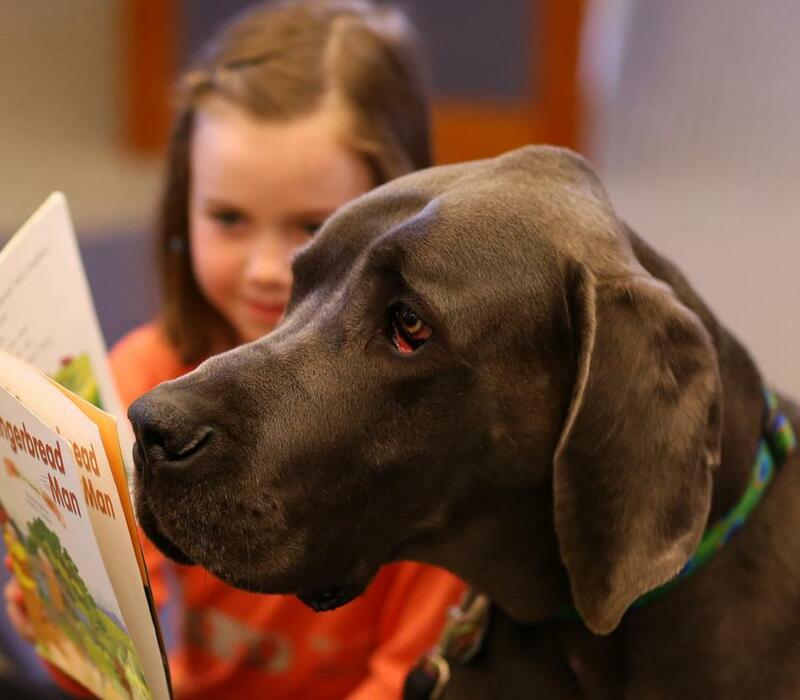 With Dash the Great Dane by her side, Madelyn Everett reads a story in the children’s section at the Hingham Public Library. It’s Saturday morning in the children’s section at the Hingham Public Library and 6-year-old Madelyn Everett is reading “Rabbit Ears” aloud. She speaks in a tiny dramatic voice, carefully tracing the words on the page with her right pointer finger. With her left hand, she holds the book open on her desk. Midway through the story, however, Madelyn’s desk begins to move. This can happen when your reading desk doubles as a 160-pound Great Dane. No matter. Madelyn hooks her arm over Dash’s massive back and repositions the book. “This,” she whispers to the dog, “is a funny one,” and picks up where she left off. Dash has been reading with children at the Hingham library for two years, alternating Saturdays with his friend Boo, a fluffy white Shih Tzu he met while training to be a therapy dog. Most of the kids who show up are between 4 and 9, but there are no rules. Some are confident, some shy and struggling. They can bring their own books or choose from the pile that Melissa Bednarski, Dash’s owner, has spread out on the floor next to the dog’s blue yoga mat. Each session is 15 minutes, and there’s plenty of petting and laughing on top of the reading. The whole scene is low-key and relaxed and that, according to research in the relatively new field of animal-assisted reading, is why it works. A happy place, in other words. A place where a kid feels free to make mistakes without fear of pressure from adults or ridicule from peers. And while the data are sparse, evidence points to myriad benefits, from improved skills and increased confidence to lower stress levels and greater love of reading. Dash and Melissa and Boo and his handler, Toni Burnham, were certified as Reading Partner teams at Dog B.O.N.E.S. (Dog Building Opportunities for Nurturing and Support), a Scituate-based, volunteer-run organization that opened in 2002. Founder Jeanne Brouillette doesn’t know how many libraries and schools use the more than 200 teams that have come through her doors, only that “it’s a very big draw.” A quick Google search turned up libraries in Watertown, Charlestown, Arlington, Lincoln, Framingham, Milton, Stow, Marshfield, Tewskbury, Medway, North Reading, Cohasset, and Plainville that offer reading time with dogs, and that’s just the first two search pages. Brouillette created her Reading Partner program based in part on the first program of its kind — R.E.A.D. 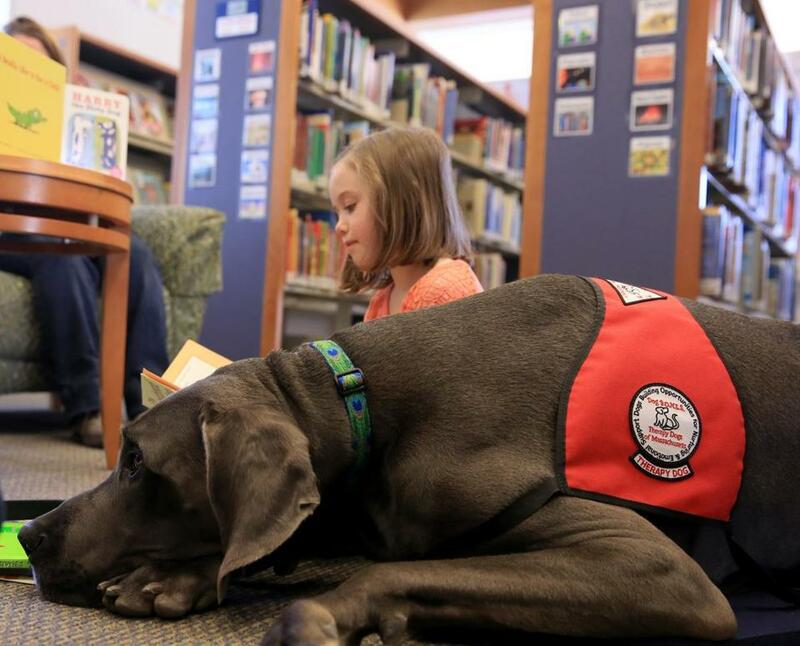 (Reading Education Assistance Dogs) — which was established in 1999 in Salt Lake City as part of Intermountain Therapy Animals. ITA executive director Kathy Klotz wasn’t sure her idea — a literacy support model utilizing therapy dogs — would have legs, but from the outset it just kept rolling, she says. Their tiny pilot program, in which a dozen elementary school children spent 20 minutes a week reading with a dog, produced impressive results: every one of the 12 kids advanced two to four grade levels during one academic year. Since then the R.E.A.D. program has created industry-standard guidelines and a training manual, and registered over 5,000 handlers that work in 50 states and 15 countries. When I ask Klotz to try to explain the human-dog dynamic at the heart of her work, she quotes Maya Angelou. A less obvious but equally important part of the process is the work of the dog’s handler. R.E.A.D. training encourages them to be sensitive intermediaries, redirecting their dog’s attention when it strays, interjecting when a child seems stuck or confused with questions like “Fluffy didn’t really understand that, can you explain that word?,” and gently facilitating a sense of connection between child and dog. “Dash doesn’t even know what underwear IS,” says Beatrice. A few moments later, when the girl tries several times to sound out a word, Melissa leans in close to offer a clue. As if on cue, Dash throws back his head and shakes it side-to-side, his ears flapping like heavy blankets. Beatrice scooches to the top of the mat with her book and shows him the picture. Even a nearby reporter can feel her blood pressure dropping. Joan Anderman can be reached at jcanderman@gmail.com.